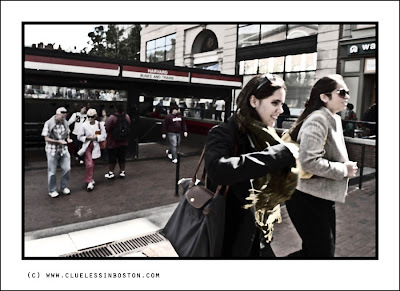 I took this quick grab shot in Harvard Square and liked it, but because it was not as sharp as it should have been, I tried to give it a look as if it were an old print that had faded a little and then been scanned digitally. Just like if you had taken it off from your private old photo album..Nice mood! Come on...it's so beautiful! Adorable students, those girls looks so happy! Have a great week , a good work and don't forget to be always happy! Whatever you did, it worked. What I like about the photo is that you caught these girls on their way to something or someone; there is a palpable sense of urgency to their forward motion. The people in the back helped you make it look like they are in the seventies! !